This high visibility parcel provides a great opportunity for a long or short-term land lease as well as a built-to-suit custom office lease. 0 Mt. Pleasant is at the gateway to Charleston’s new Upper Peninsula (UP) zoning district. This zoning district allows construction up to twelve stories so long as the lessee locates sufficient parking in close proximity to the site and meets other UP requirements for building specifications. Please contact the listing agent about short- and long-term land lease opportunities. Term and rate are negotiable. 0 Mt. Pleasant is located in the booming “neck” area of the Charleston peninsula. Many new mid-rise apartment communities dot the skyline in this technology focused area. Restaurants and brew pubs have transformed the “neck” into an area with vibrant night-life. This parcel is located at the intersection of King St., Meeting St. and Morrison Dr. and is directly adjacent to the future Low Line Linear Park, which will offer biking/walking/running trails connecting to the Upper King Street commercial district. The future lessee will have the opportunity to construct a custom up fit of their space. Plans for 0 Mt. 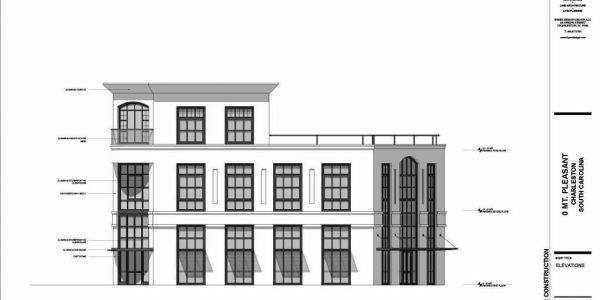 Pleasant have been approved through zoning (not including Design Review Board) and consist of a 2 ½ story; 7,200 square foot office building that includes 7 on-site parking spaces. The zoning approval also allows for a first-floor café / coffee shop sized up to 500 square feet. The current design emphasizes large windows to allow an abundance of natural light, an open floor plan and a roof deck with expansive views in all directions. Renderings are attached to the listing. Ownership would entertain offers to lease by floor (or potentially half floors); land lease offers; and lot with building master lease offers. 1st Floor – 2,500 Sq. Ft.
2nd Floor – 2,500 Sq. Ft. Size – 7,200 Sq. Ft.